"Equatore" is a small table lamp, designed by Gabriele & Oscar Buratti and manufactured by Fontana Arte, made in glass and metal and is part of a collection including table, floor and ceiling lamps. It's provided with a dimmer and lighting source is 12W LED (2700K, CRI>90, Lumen 1100). Available with glossy black metal structure and transparent smoky blown glass shade or with glossy copper structure and transparent pink glass shade. Dimensions: Base: Ø 9.4", H. 16.7", Lampshade: Ø 9.4" "Equatore" is a contemporary reinterpretation of the classic lamp with a glass shade. While the traditional abat-jour uses the shade to contain the light source within, in this family of lamps the shade is paradoxically and suggestively empty, with the light being generated by two luminous discs placed inside a central metal band, visible on the lampshade, evoking the line of the equator. The light produced by the LEDs, thanks to internal screens arranged in layers, is distributed regularly across the surface of the discs, magically illuminating them. 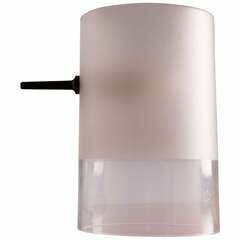 The lower disk directs the light output downward, the upper one illuminates the glass cap for a soft and diffused light. Available in table, floor and ceiling models, in two sizes and two colors: a cooler version in gray with a dark chrome frame, and a warmer version with a transparent pink cap and a copper-colored frame. "Equatore" collection, designed by Gabriele & Oscar Buratti and manufactured by FontanaArte, is the winner of the 2017 edition of the Archiproducts Design Awards in the Lighting category. Gabriele Buratti (1962), architect and professor of interior design at the Facoltà del Design of the Politecnico di Milano (2003-2010), and Oscar Buratti (1967), architect, have founded the architecture and design studio Buratti Architetti. The studio is openly involved in projects of different scales, from architecture of buildings and urban areas to interior design, from furniture and product design to exhibition and showroom designs, in an intense and multifaceted professional path, in which themes, locations, brands, people, materials and workmanship mingle together contaminating each another. They design residential, commercial and industrial buildings, they carry out projects in historical city centres and refurbishing measures of building complexes, they design villas and interiors of working, residential, retail spaces, in Italy and abroad, with the aim of combining culture with professional specialization, experimentation with technique and original visions with a high standard quality. In the retail sector they collaborate with prestigious brands such as: La Perla, Automobili Lamborghini, Husqvarna Motorcycles, BMW, Ducati, Oroblù, LeBourget, Acerbis Italia, Tre Marie/Barilla, designing boutiques in the major cities around the world. In the field of design they collaborate with major companies such as: Acerbis International, Alias, Antonio Lupi, B&B Italia, Effetti, Antonio Frattini, Gallotti&Radice, iGuzzini, Living Divani, Paola Lenti, Poliform, Poltrona Frau, Porada, Porro, Roca, Silvelox, Tecno, Valli&Valli, Vondom. Available in two colors: a cooler version in gray with a dark chrome frame and a warmer version with a transparent pink cap and a copper-colored frame.\nPlease inquire for additional information. 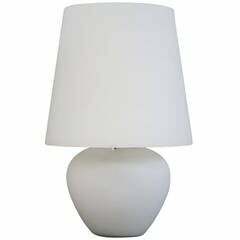 White glass table lamp. Three different light sources: base, shade or both. 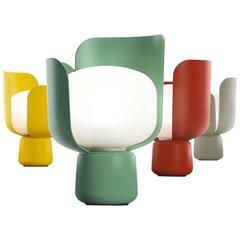 Rare "Fatua" table lamp by Guido Rosati for Fontana Arte. Totally composed by a glass cylinder with sandy part to better diffuse the light source hidden. 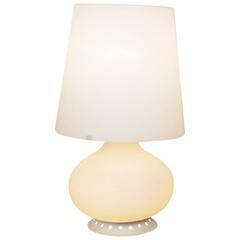 "Daruma" by Sergio Asti for Fontana Arte 1968 Pair of white glass table lamps Perfect condition Perfect working order. Measure: H 36 x 34 cm H 17 x 16 cm. Beautiful and interesting table lamps by designed by Umberto Riva in 1989 for Fontana Arte in aluminum, bronze and Murano glass. There are 2 available.